The locale is Moscow. The year is 1952. Joseph Stalin is in his 30th year in power as the general secretary of the Soviet Communist Party, and even at the ripe old age of 72, Stalin wields enough clout to keep his enemies, both inside and outside the government, in check. Still, as anti-Stalin sentiment grows, a faction toils in secrecy to take down the Communist icon. To do so, they plan to detonate a secret weapon during the Bolshevik Assembly. 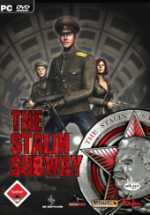 In it, you'll play as KGB officer Gleb Suvorov, racing to prevent the explosion that would take out the Assembly, Stalin, and a massive number of innocent civilians as well. As you do so, you'll explore the darkest secrets of 1950s underground Moscow; secret military subway lines, suburban catacombs, and even the secret bunker of Stalin himself. Aboveground, you'll be creeping and shooting your way through more familiar locales, including the Moscow State University construction site, the MGB building at Lubyanka Street, and, of course, the Kremlin. You can use authentic weaponry, including those that have never been offered in a computer game such as anti-tank rifle PTRS-41. The NPC's are able to show an emotional reaction to the environment and the player's actions. There's over 300 types of destroyable objects: book-cases, chairs, ashtrays and so on.